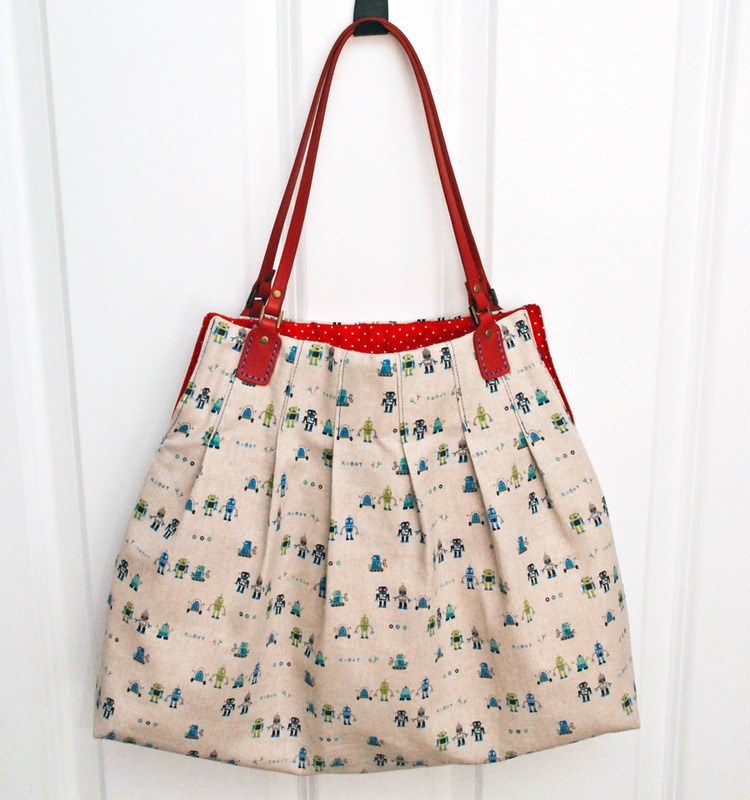 Free Bag Purse Pattern ~ DIY Tutorial Ideas! • All seam allowances are 3/8in (1cm) unless stated. • WSO/RSO/WST/RST = wrong/right side out/wrong/right sides together. • 3/4yrd (3/4m) Fusible Fleece (fusible is a must. Don’t use sew-in, it makes pleating a nightmare!). • 21in(W) x 15 5/8in(H). (53cm x 40cm). The short edges are the side edges. 2. 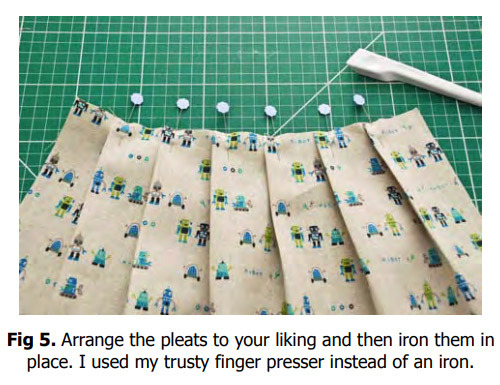 If using, iron the fusible interfacing onto the wrong side of the exterior fabric pieces. the WS of the lining pieces. See Fig 1.
the top edge. These markings are your ‘V-markings' and will be important for later. 5. Make 2 marks for the first pleat - On the RS top edge of one of the exterior fabric pieces work from right to left to make the 2 markings as shown in Fig 2. 6. 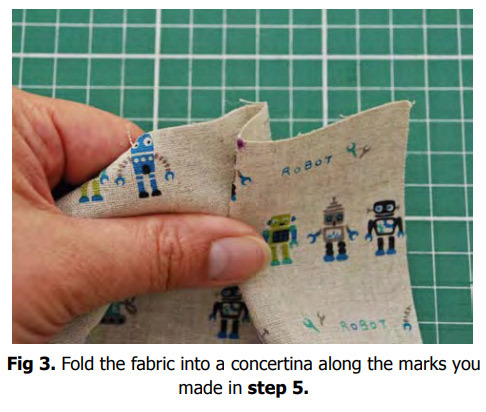 Fold the fabric into a concertina to make the first pleat. 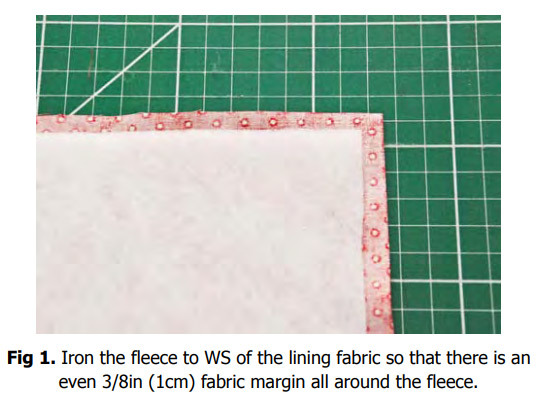 Using the markings you just made, fold the fabric as shown in Fig 3. Place a pin into the pleat. See Fig 4. 7. 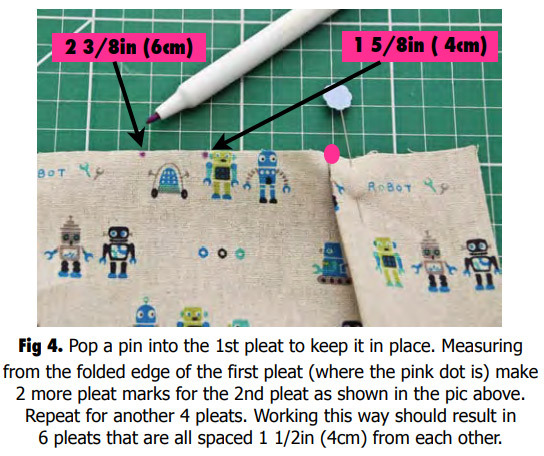 Make another 2 marks for the 2nd pleat (work from right to left as before) see fig 4. Fold the 2nd pleat in the same way as for Step 6. Mark and fold another 4 pleats in the same way so you have a total of 6 evenly spaced pleats running along the top edge. Set aside. 9. Take one of the exterior pieces and fan the pleats out so that they look pretty and reasonably even. If you can, aim to arrange the pleats in a softly curved top edge. When you’re happy with the way the pleats sit, iron the folds approx 5 1/2in (13cm) down from the top edge. See fig 5. 10. Now to mark the pleat stitch lines. 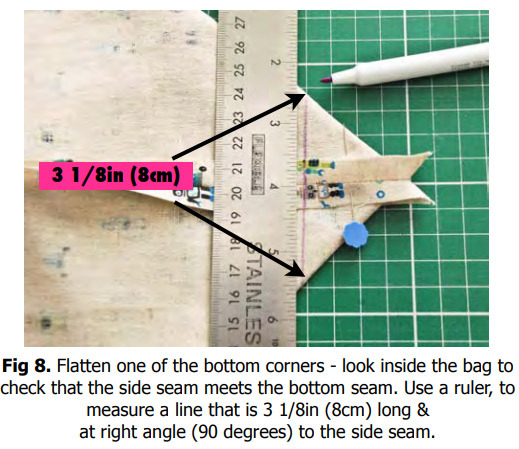 Measure and mark 4in (10cm) down from the top edge on both the OUTER pleats See fig 6. 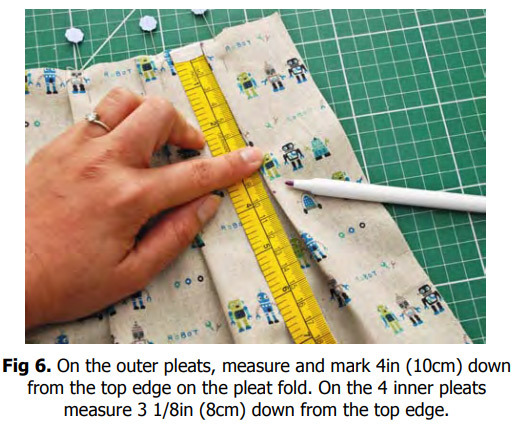 Repeat this step for the remaining 4 pleats EXCEPT you need to measure 3 1/8in (8cm) down from the top edge. 11. Now to stitch the pleats in place using the pleat stitch lines we just made as a guide. If you like you can use more pins down the length of each pleat before stitching them. Topstitch the pleats in place though all layers. 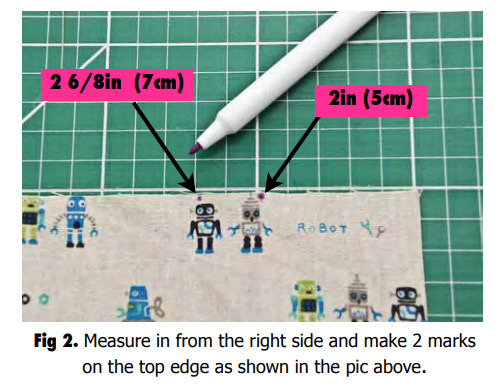 Be sure to sew a few reverse stitches at the end of each line to secure the stitches. See fig 7. 12. Repeat Steps 9-11 for the other exterior fabric piece. Be sure to compare and match the two exterior fabric pieces (for equal curviness at the top edge from Step 9) before you commit and stitch! 13. Bring the 2 pleated exterior pieces RST match all edges and pin. Starting and stopping at the V-markings (that you made in Step 4) stitch the exterior pieces together. (The V-markings are so called because this is the point where the top part of the bag opens out into a ‘V’ (or 2 flaps). Stitch all along the sides and bottom edges. Be sure to sew securing stitches at start & end of your stitches. Iron the seams open. 14. 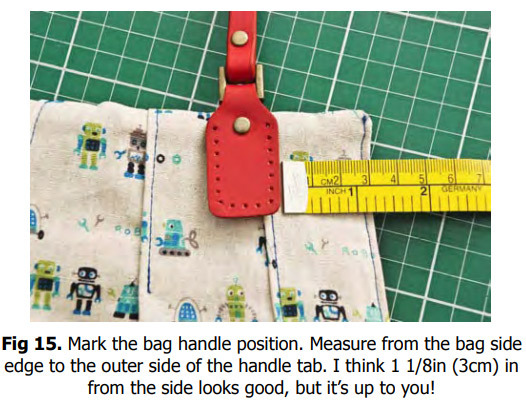 Create a flat bottom for the bag. 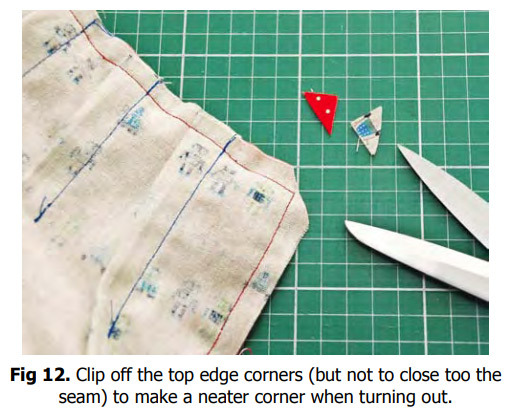 Grab one of the bottom corners of the exterior and match the side seam with the bottom seam. Flatten to form a triangle. Square off the triangle tip as shown in Fig 8..
15. 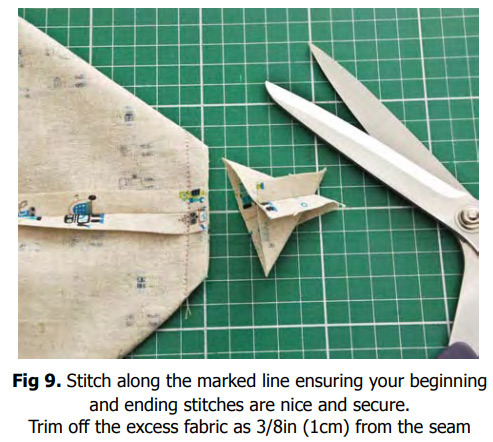 Stitch along the line you made in the previous step and then trim off the excess fabric See Fig 9. Repeat Steps 13-14 for the other bottom corner. Turn the exterior bag RSO. 16. 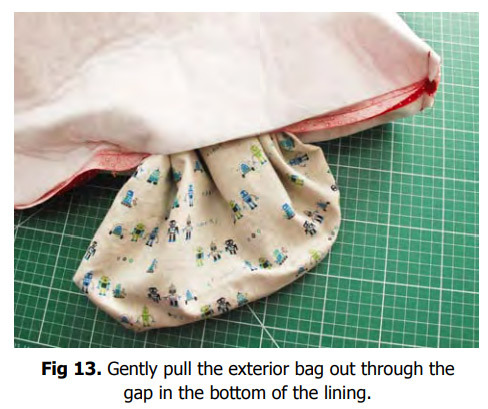 Make the bag lining in the same way as the exterior bag by repeating Steps 5-15 EXCEPT at Step 13 you need to leave a gap of 6in (15cm) in the bottom edge for turning out at a later stage and you need to leave the lining bag WSO. 17. 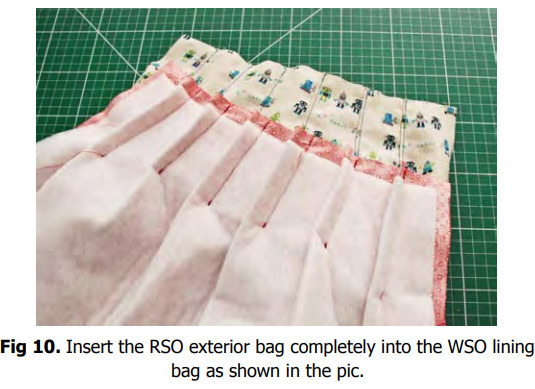 Insert the bag exterior (still turned RSO) into the bag lining. The right sides of the bag exterior and the lining should now be touching each other. See Fig 10. 18. You’ll see that the top of the bag forms a ‘V’ (or 2 flaps). 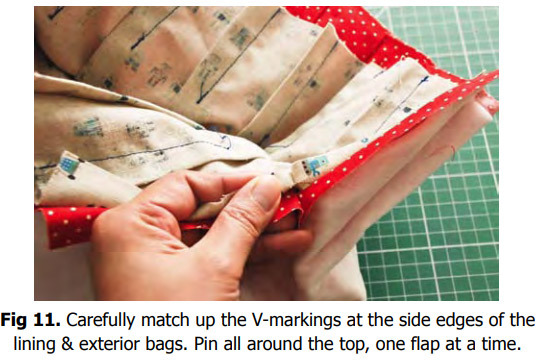 Before pinning together take extra care to match all V-markings at the side edges of the lining and exterior bags. See Fig 11. Carefully line up the lining and exterior raw edges of both flaps, pinning one flap at a time. 19. Stitch one flap at a time. Begin stitching at the V-marking. 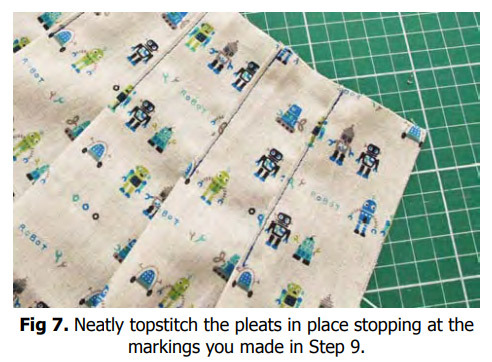 To start, actually place your needle into the V-marking (where the start/end stitches from Step 13 are situated). Stitch all around the sides and top edge stopping at the other V-marking. Repeat with other purse flap. Clip off the flap top edge corners. See Fig 12. 20. Turn the whole bag RSO by carefully teasing the exterior bag completely out through the opening in the lining. See fig 13. Push the top edge corners out with a pointy tool. 21. Stitch the gap in the lining shut by pushing the seam allowance inside the hole and topstitching close to the edge for a neat finish. Pop the lining into the exterior. 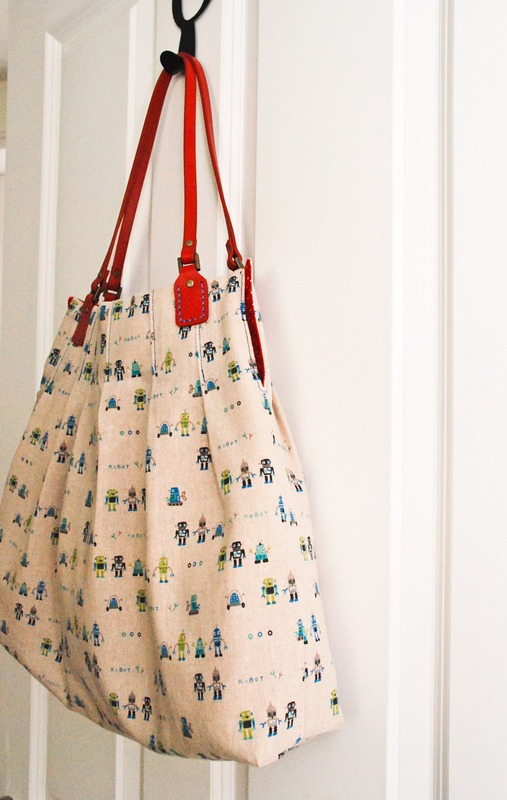 Place a pressing cloth or tea towel over the exterior and iron out any creases in the bag (use a travel sized iron if possible - it's handier for getting into them nooks and crannies!) 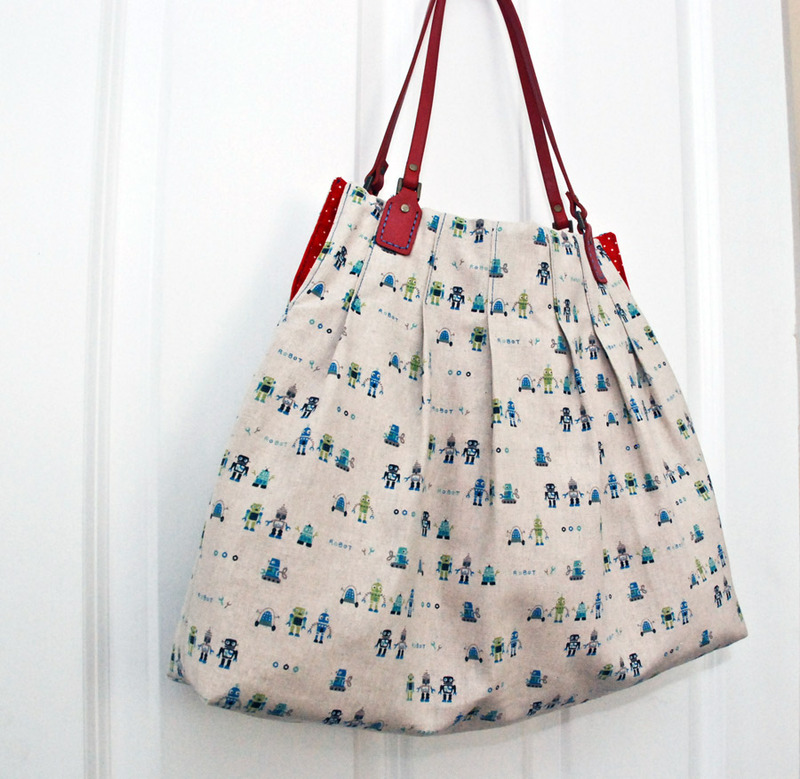 The pressing cloth will prevent any goo or scorch marks getting onto your yummy new bag. 22. 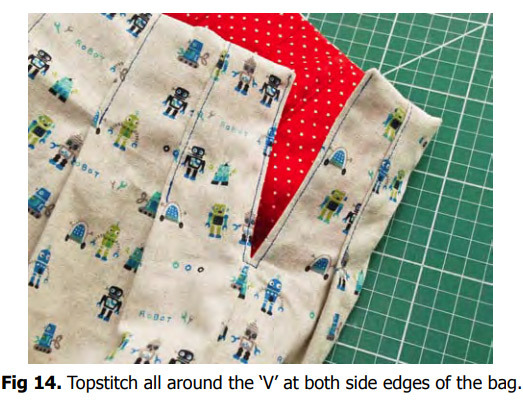 Reinforce the ‘V’ at both side edges of the bag by topstitching all along the ‘V’. Ensure your top & bottom threads match your fabrics! See Fig 14. 23. Mark the position for the bag handles. I chose to place the outer side edge of my handles 1 1/8in (3cm) in from the side edge, but it’s up to you where you put ‘em. See Fig 15. 24. 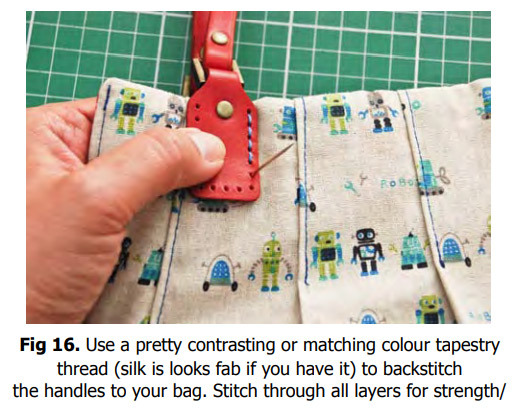 Use tapestry thread to backstitch the handle tabs to your bag. Stitch through all layers. This is a nice job to do whilst watching the telly. See Fig 16. 25. Ta Dah! All finished and looking good!! I’ll see you at the local deli (with your new bag) for a nice tall mocha. Hehe! I really like this purse. I will say that I might make my handles by covering cord if I can't find handles.